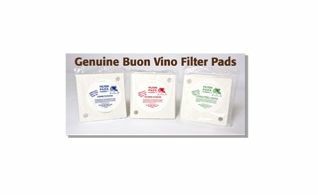 Buon Vino filter pads that are compatible with Buno Vino filtering machines. Mini Jet Filter Pads #1 Coarse. Mini Jet Filter Pads #3 Fine. Mini Jet Filter Pads #2 Medium. Super Jet Filter Pads #3 Fine. Super Jet Filter Pads #2 Medium.